This movie shows the evolution of a two-dimensional curtain-like atmospheric transport barrier passing over Virginia Tech in Blacksburg, Virginia (small circle). The barrier is not a material/solid structure; it is a visualization tool that highlights a dynamical boundary separating masses of air with different properties: the flux across the boundary is very small and this translates into low mixing across the boundary. The simulation is based on atmospheric data from National Oceanic and Atmospheric Administration and the barrier has been located exploiting the concept of Lagrangian coherent structures (LCS). The LCS are surfaces of local maximum stretch in a flow. Due to their definition they act as separating surfaces and help in the visualization and characterization of transport phenomenon in fluid flows. For example, suppose airborne microorganisms are present on one side of the barrier. These will not cross the "orange wall", staying on their "side" during the motion. These surfaces can help in the prediction of spread of microorganisms, diseases, and pollution both in the atmosphere and ocean. This movie shows the Antarctic ozone hole splitting event of 2002 as revealed by atmospheric transport barriers, objects computed using the Lagrangian coherent structure (or LCS) framework. The ozone hole resides within a dynamical strucuture called the Antarctic polar vortex. The evolution of LCS curves, the time dependent analogues of separatrix surfaces, is shown for the days surrounding the splitting event (based on NCEP/NCAR reanalysis data). The attracting (repelling) curves, analogous to unstable (stable) manifolds, are shown in red (blue). Before and after the splitting event in late September, we see an isolated blob of air, bounded by LCS curves, slowly rotating over Antarctica. In the days leading up the splitting, the vortex pinches off, sending the 'upper' blob off into the midlatitudes while the 'lower' one goes back to its regular position over Antarctica. The rich lobe structure has implications for stratospheric transport and mixing. See a zoomed in movie here and a comparison with ozone data from satellite data. This movie shows the part of a low energy multi-moon trajectory where the switching of the dominant perturber takes place, from Ganymede to Europa (from the outer moon to the inner moon). This portion of the orbit is called the switching orbit. Before the switching orbit, Ganymede is the dominant perturber and the effect of Europa is negligible. During the switching orbit, the spacecraft has its apojove just ahead of Ganymede, and as a result gets a significant "kick" resulting in a smaller perijove. The resulting perijove is small enough that now Europa's effect (i.e., kicks) can be significant. The switching orbit is appropriately timed (using specially chosen initial conditions and control inputs) such that the spacecraft will pass ahead of Europa at the immediately following perijove, resulting in a further kick, this time resulting in smaller apojove, so small that Ganymede's kicks are no longer significant. This results in Europa now being the dominant perturber, and subsequent kicks by Europa lead the spacecraft onto a more circular orbit until finally the spacecraft enters the final portion of the tube leading to capture into an orbit around Europa. The whole inter-moon transfer trajectory is shown sped up in this movie where the spacecraft's semimajor axis and eccentricity is also plotted. The switch occurs where there is a bend in this plot, which implies transfer from a Tisserand curve (or three-body energy) in the Jupiter-Ganymede-spacecraft system to the Jupiter-Europa-spacecraft system. This movie (also on YouTube) shows the separation of spherical inertial particles of two different sizes in a fluid. Particles which start out in the same mixture are segregated by size into two different zones in the fluid--the opposite of mixing. Particles with inertia, measured by the Stokes number, need not follow the path of the fluid. The movie shows particles with two different Stokes numbers, 0.1 (blue) and 0.2 (red), being injected into the same small region in a two dimensional cellular flow with the same non zero initial velocities relative to the fluid. Ridges in an appropriately computed sensitivity field partition the relative velocity subspace at each point in configuration space, with particles belonging to different partitions having different final locations in the configuration space. The location of these ridges depends on the Stokes number. The relative velocites of the red and blue particles in the movie are selected from a region that is sandwiched between two ridges. This achieves separation. This movie shows the paths of three vehicles in a double-gyre flow. The gray one is passively advected by the flow, while the orange and white vehicles are attempting to go from a starting point (green triangle) to a target (green square), by turning on or off an engine capable of producing a speed comparable to the maximum speed of the flow itself. Under these conditions, the white vehicle makes it to the target first, but uses more than 10 times the fuel of the orange vehicle, which cleverly navigates using Lagrangian coherent structures (LCS, red features). The non-intuitive initial behavior of the fuel-efficient orange vehicle is a consequence of the global properties of the flow. Here are the same trajectories, but with only the flow velocity vectors. The LCS reveal non-obivous fuel-efficient routes. 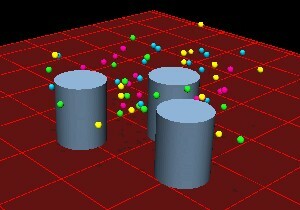 In this animation, four swarms of different colored vehicles pass through each other at an "intersection" where some buildings are in the way. The spheres denote a vehicle's safety shell. Collisions occur if the safety shell touches an obstacle, another vehicle, or the ground. In the simulation, there are no collisions, despite the crowded conditions, and each of the 64 vehicles gets to its intended destination. Computations by Shane Ross. For more information contact Shane Ross. Optimal rowing or flapping strokes for self-propulsion in a perfect fluid | (paper). A movie of a four-segment mechanism or animal propelling with flapping (rowing) strokes which yield the greatest locomotive efficiency, as described in the paper Ross . A movie of a small asteroid companion bouncing off of a much larger rotating asteroid (as seen in an inertial frame). The trajectory of the particle can be very complex. In solar rotating frame, centered on Sun-Earth L1. In solar rotating frame, trajectory from Earth rendezvous with a trajectory on a halo orbit about the Sun-Earth L1.